As our kids read Quran, the various punctuations can create confusion and interrupt their flow. I love this idea from Islam From the Start to illustrate the punctuation. Our responses to each punctuation mark are compared to a traffic light. Red means stop and green means to keep going. Yellow means that you have a choice of whether you would like to stop or not. This traffic light can be used as a bookmark to become an easy resource to glance at while reading Quran. I was inspired by this and decided to take it a step further, and include it in a game format. 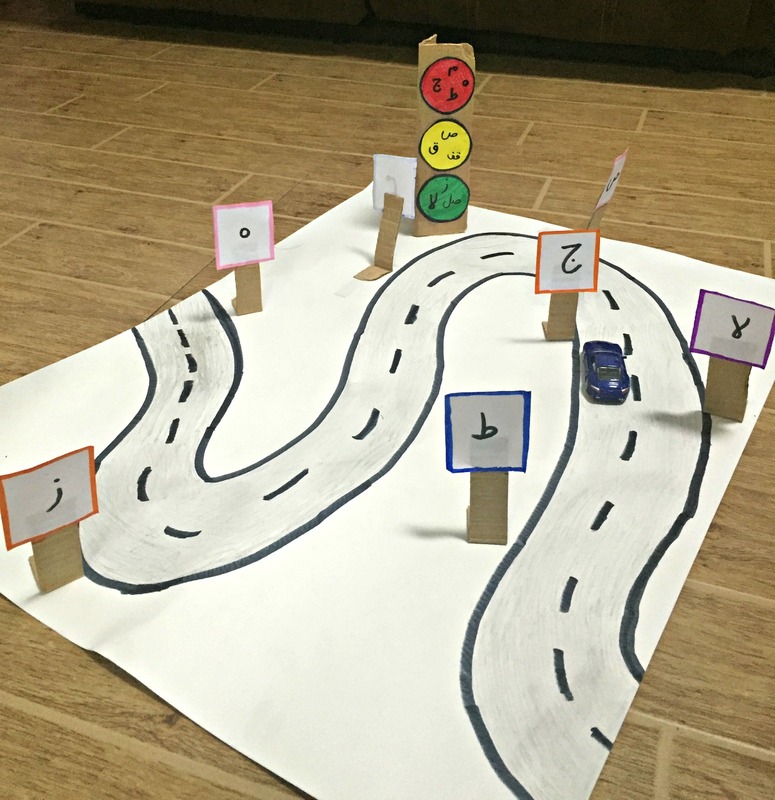 I created a road on a poster board, and instead of road signs, I placed the various Quranic punctuation marks along the road. When a child is driving their car along the road, they will encounter the “road signs” and they follow those signs. For example, at a “taa,” the kids will treat is as a stop sign, where they will stop, and then continue driving. At a “zayn,” the kids will keep driving without stopping. This is a fun way to bring the punctuation marks into another context to allow them to happily practice what they are learning. At the beginning, I placed a traffic light with all the letters as a handy resource on the picture of the road, but as they start to remember what each sign means, I would remove the traffic light to increase the challenge.